Thanksgiving is a holiday full of great foods, great smells, and a whole lot of history. There’s your family history—family stories, health, ancestry—and then there’s the history right in front of you, hiding on the plate. Many of the foods we typically eat around Thanksgiving have a rich past, but none quite as rich as the sweet potato. Native to the Caribbean, the sweet potato has been a staple in indigenous peoples’ diets for hundreds of years1. Over time, this starchy root has migrated well beyond its ancestral home, becoming one of the world’s most valuable and nutritious crops. It’s not surprising that the sweet potato was valuable to early humans: Aside from being tasty, the sweet potato is packed with vitamins, carbohydrates, antioxidants, and other nutrients1. But what is surprising is just how far the sweet potato spread—somehow it became a food source to native peoples in remote Pacific islands. If that doesn’t sound impressive, consider the fact that Christopher Columbus’ journey to the Caribbean in 1492 may well be the first recorded contact between Europe and the Americas2,3. Prior to this meeting, it’s believed no one could have traded goods across the vast amount of space that is the Atlantic Ocean, much less the larger Pacific. Yet somehow, a South American potato made its way across the Pacific hundreds of years before Columbus’ journey. Learning about the sweet potato’s past could potentially rewrite human history. Want to learn about your genetic ancestry? We’re here to help! So what do we know about the ancestral migrations of this Thanksgiving staple? Currently, there are multiple theories for how the sweet potato spread. A popular theory is that Pacific Islanders made contact with indigenous Americans, during which time they traded for sweet potatoes. This is a likely possibility when considering some language similarities: Some groups of indigenous peoples in Peru refer to the sweet potato as cumara; 6,800 miles away, native New Zealanders grow a sweet potato called kumara. Looking at the similarity between these words, it’s hard to imagine that it’s a coincidence1-3. Oftentimes, the evolution of language across time and space has reflected the migration of people throughout history (for more context on this phenomenon, see LL Cavalli-Sforza’s book, Genes, Peoples, and Languages)4. Scientists have learned how to use DNA sequencing to study ancient human migrations. Though we typically think that you can only learn about human history from human DNA, that’s not actually the case. With the sweet potato, scientists may learn about human history by studying its DNA. 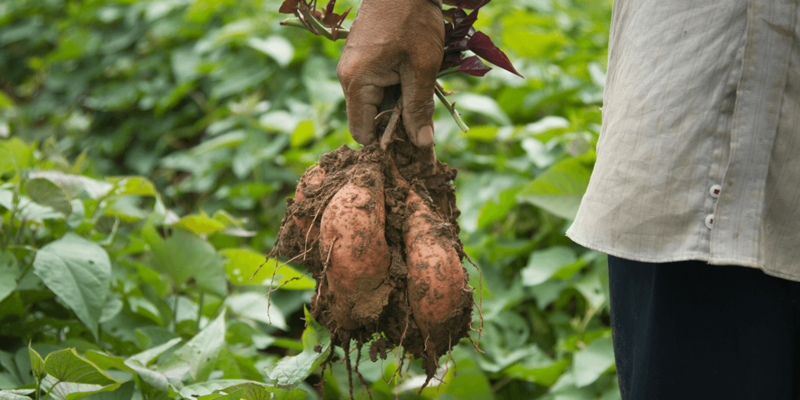 Scientists have recently sequenced DNA from sweet potatoes grown across the Pacific5. What they found was that all sweet potatoes likely trace their ancestry back to one ancestral population located somewhere in the Caribbean. This is an important finding because it indicates they’re all related species, and not just similar looking plants. It also suggests that there had to be some event that carried a sweet potato from South America to the islands of the Pacific. However, the sweet potato DNA also had a surprise in it: Analysis indicated that island sweet potatoes diverged from mainland sweet potatoes tens of thousands of years ago. To researchers, this could mean two things: Early humans may have traded a variety of sweet potato that has since gone extinct on the mainland, or that it wasn’t humans who carried the potato across the ocean. It’s possible—though still debated—that a sweet potato made the journey by way of another animal (possibly as a seed in an animal’s belly)5. Thus far, it’s still not clear how sweet potatoes spread across the Pacific. The similarity in indigenous names for the starchy root, and their shared ancestry, could be evidence that indigenous americans had some form of contact with Pacific Islanders. If this were the case, it may change the way we view human history and how we understand the influence that seemingly distant cultures had on one another. But for this week, at least, they’re mostly just changing our dinner plans. 1Bovell‐Benjamin, Adelia C. “Sweet Potato: A Review of Its Past, Present, and Future Role in Human Nutrition.” Advances in Food and Nutrition Research, 2007, pp. 1–59., doi:10.1016/s1043-4526(06)52001-7. 2Fox, Alex. “Sweet Potato Migrated to Polynesia Thousands of Years before People Did.” Nature, Dec. 2018, doi:10.1038/d41586-018-04488-4. 3Zimmer, Carl. “All by Itself, the Humble Sweet Potato Colonized the World.” The New York Times, The New York Times, 12 Apr. 2018, www.nytimes.com/2018/04/12/science/sweet-potato-pacific-dna.html. 4Cavalli-Sforza, Luigi Luca. Genes, Peoples, and Languages. Univ. of California Press, 2006. 5Scotland, Robert W, et al. “Temporal Dynamics of the Origin and Domestication of Sweet Potato and Implications for Dispersal to Polynesia.” 2018, doi:10.1101/309799.